Svetlana Filippova Art & Design: Best of HOUZZ 2017 awards won ONCE AGAIN! Best of HOUZZ 2017 awards won ONCE AGAIN! 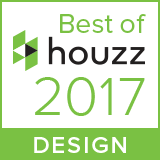 Lana Filippova Interiors has been chosen as a Best of HOUZZ 2017 winner for Design and Customer Service. Lana Filippova Interiors has produced outstanding work work and contribution to HOUZZ with an award winning designs celebrated by the HOUZZ community of more than 40 million users worldwide. The projects represented on HOUZZ have been recognised by HOUZZ customers and professionals alike. To see more projects and images, click on HOUZZ button at the bottom of the page.